Good morning everybody and thanks again for letting me this opportunity to do this blog. I arrived to London last Wednesday and one thing different this year is that .... it has been raining all the time! We had such a lovely summer last year! Anyway it is great to be back here in the UK playing this fantastic event. Lots of things to tell you but really not many different things except for this weather. Hopefully it will change and will allow the tournament to go on without many headaches! Because imagine all those players from the section of the draw I am playing that spent the whole day at the tournament waiting to play and that in the end they could not play! And just wanted to say something about the big news of this past week end! Rory amazing!!!! Big congratulations to him! IT is so nice to see him play! He deserved to win and I am very happy for him and for all his family, team, friends and fans! Well done! Rafa: Hello, I use to spend 2 or 3 hours playing tennis and even football. But at that age more or less I had to stop football since it was too much and stayed with tennis. You know classes and studies together with sport was what I was doing. Yes I like to cook here in Wimbledon at the house. I also prepare fish and vegetables, grilled. I buy very good tuna fish and salmon here which I love. The salmon I do it with teriyaki sauce. Wow! So you say I am arrogant? I am only focused and concentrated on the point. I don't think I behave arrogant, sorry to not agree with you. Not sure I would do it, specially here with all this rain! So i really admire all you and thank you for doing that. I would queue for the golf event! Yes, there are many adjustments to the grass compared with clay for example. Almost everything is different. Like all fast surfaces you have to try to stay closer to the base line. 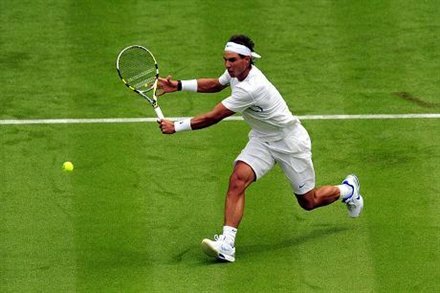 The serve os also more important and also the body position here is lower since you hit the ball down more than up. Many things to change actually. Well, I am not sure they always really mean it. But it is something that helps I suppose. This is a very interesting question but I really don't know the answer would have to think about it. BUt for sure someone historic, some one who was important in the history of my country. or maybe some sportsman that had really important moments to ask how he handled the situation. OR some world businessman... I don't know but thanks for this since will think about it. We always have pressure but the fact of winning Roland Garros really releases some of that pressure and makes me play with more calm.